Not surprisingly, Week 3 in the NFL came with a ton of surprises. After the all the carnage, there are only four undefeated teams left going into Monday night. Two of those teams look like unbeatable offensive juggernauts. The other two also have made a splash with big scoring plays. That’s contributed to an interesting start to the season and roller-coaster results in our power rankings ahead of Week 4. Here’s how the teams stack up against each after three games. Jared Goff and Todd Gurley are taking turns ripping into defenses, and they will need to keep rolling with Marcus Peters missing on the other side for a while. Patrick Mahomes is still in a groove, but the running game and defense issues continues to linger. That doesn’t matter much when the Chiefs are blowing teams out. Drew Brees, Michael Thomas and Alvin Kamara are the new elite triplets in the NFL, and they’re carrying this team until the defense starts to semi-resemble the 2017 version. Cam Newton and Christian McCaffrey have officially found their groove in Norv Turner’s offense. The defense now needs to work on being more consistent after the bye. Carson Wentz’s return was a bit rusty, but he did enough to help the Eagles grind out a victory. Things will only get better as they get healthier, namely Jay Ajayi and Alshon Jeffery. Blake Bortles and the offense need the spark of Leonard Fournette to maximize their potential and avoid slumps. They can’t afford to waste dominant efforts by their elite defense. The Bengals have enough offense to complete with anyone, but it will get harder if A.J. Green has to miss time with his groin injury. Joe Flacco is playing much better than you think, and they have a good situational running game. The defense will be at full strength to wreak havoc as it should soon. Matt Ryan is balling after that mess of a Week 1, and a big reason has been rookie receiver Calvin Ridley. They need every bit of Matty Ice with their defensive depletion. What was that? The Patriots seem to be in a holding pattern until they can get Josh Gordon and Julian Edelman in their offense together. Neither can help a struggling overall defense, however. What was that? The Vikings’ offensive line issues are one thing, but the defense also didn’t look ready for Josh Allen. They need to dig deep to start looking as good as their talent dictates. A hobbled Aaron Rodgers is doing his best to overcome the lack of a running game and a reeling defense, but we’ve seen this before. There’s too much on the QB. The defense still stinks, but Ben Roethlisberger is still great, so there’s that to keep them playoff competitive. There probably was still enough Fitzmagic on Monday night to keep Jameis Winston on the bench upon return. The Khalil Mack trade is paying huge dividends, especially with Mitchell Trubisky struggling to move the ball consistently. Alex Smith and Adrian Peterson keep turning back time, but the defense and the offensive line have been the backbones of the team. Now it comes down to more consistency. 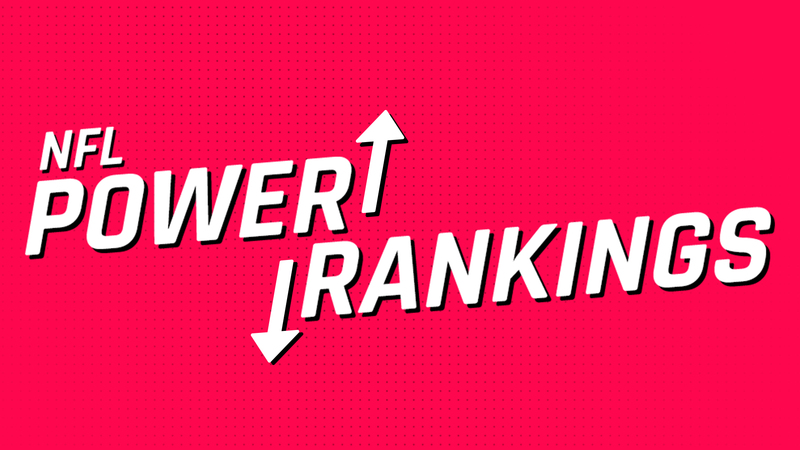 The Chargers have lost to the two top teams in our power rankings. They still look good and will finish better than their current record indicates. The Browns are close to being 3-0, but with the future already here with Baker Mayfield, they will focus on the next big step: a winning streak. The Broncos do some things well like stop the rush and run the ball with different players, but overall, they’re average at best. The Titans have no business being above .500 given how ugly their first three games have been. But that’s a credit to rookie coach Mike Vrabel finding a way with his new team. Russell Wilson got a running game and some decent protection, and look what happened. Earl Thomas may be “holding in,” but he’s not holding back for their defense. The 49ers lost Jimmy Garoppolo for the season and Richard Sherman for a while. All hopes for any playoff run are lost with those developments if the 49ers stand pat. Dak Prescott and Ezekiel Elliott have the burden of offense falling on them, and the limited production is starting to drag down the defense, too. The Lions suddenly found a defense and a running game at an opportune time against the Patriots. The bad vibes from the first two weeks are quickly fading. Sam Darnold continues to play well, but since their explosion in Week 1, the Jets have cooled off with the aggressiveness, and it has cost them twice. Turns out Eli Manning has something left, and Saquon Barkley is just beginning. Again, keep an eye on that defensive bounce-back keeping them relevant in the NFC. Congrats to Josh Allen and Sean McDermott for putting together a complete game to shock Minnesota. Hopefully the Bills can keep riding that fire to be competitive again. Deshaun Watson and J.J. Watt are not getting enough help around them to get Houston victories. Things looked good for Jon Gruden in Miami until, for a third straight week, he got outwitted when it counts in the second half. Let’s see what Josh Rosen can do over full games. There’s no way the offense can be worse with him than it was with Sam Bradford.